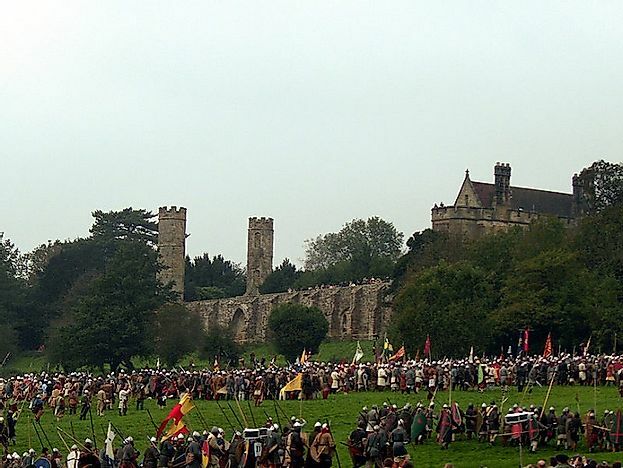 Modern Britons reenact the 11th Century Battle of Hastings which set the stage for the Norman Invasion of England. Great Britain has engaged in major battles that span a timeline of more than nine centuries in history. These have been fought on several different continents and have included British wins, losses, and stalemates. The battles are considered significant since they influenced the nation’s history, politics, and culture. While some battles were fought on the UK’s soil, others were fought in other countries, and in some cases, in alliance with other European powers. Some of the most import battles in the history of the United Kingdom are looked at below. The Battle of Hastings was fought on October 14, 1066. The battle was part of the Norman conquest of England. Before the battle, King Edward, the Confessor of England, had died without an heir in January of the same year. Harold was subsequently crowned King. The offensive in the battle was launched by the invading William of Normandy, who regarded the coronation of King Harold as illegal. The English army fought in the traditional English way, almost entirely by foot alongside a small number of archers. William’s army fought with both infantry and cavalry. The English established a shield wall in a suitable location, and that proved hard to break for the Normans. The Normans, on the other hand, pretended to run away in panic, and then engaged the enemy troops in pursuit. The decisive moment in the battle came with the death of King Harold when the English army retreated in defeat. The battle culminated in a victory for William of Normandy. The battle was politically significant, as it led to the oppressive foreign aristocracy characterizing Medieval England. The victory of William Normandy marked a turning point for England. French was adopted as the language of the king’s court, and merged with the Anglo-Saxon language, gave birth to modern English. Castles were built under the Norman rule, which serves as historical and cultural landmarks in modern day UK. The battle is visually depicted in the Bayeux Tapestry, embroidery that is more than 900 years old. The Battle of Agincourt was fought on October 25, 1415. The battle is regarded as one of the most famous English military victories and was part of the greater Hundred Years’ War. The battle was fought near Azincourt, in northern France. The English army was led by King Henry V against the French army led by Constable Charles d’Albert. The English army, though severely outnumbered, had large numbers of skilled archers. The battle was almost entirely fought on foot, by use of crude weapons such as axes, hammers, mauls, and maces. The battle ended in an unexpected victory for the English. The battle is famously depicted in William Shakespeare’s play Henry V., The battle depiction in this play, has been the basis used for several films. The battle is also depicted in various artistic forms in modern day popular culture. The Battle of Naseby was fought on June 14, 1645, and was a significant battle in the English Civil War. The battle was fought between the Royal army under Charles I of England and Parliamentary troops led by Sir Thomas Fairfax. The battle was to be vital in ending the nearly three-year civil war. The Parliamentary forces were centralized before the battle to form the New Model Army. The New Model Army, better equipped and organized, defeated the Royal Army, resulting in a decisive win for the Parliamentarians. The Parliamentarians thwarted the Royalists’ chances of winning the greater civil war. The battle has been depicted in various literary works and film productions. The Battle of Blenheim was fought on August 13, 1704, and was one of the most important battles of the War of the Spanish Succession. England, Scotland, German Empire and the Dutch Republic, together comprising the Grand Alliance, under the Duke of Marlborough engaged the forces of France, Bavaria, and Spain under Max Emmanuel and Marshall Tallard. Weaponry included artillery, swords, dragoons, hand weapons and horses. The Grand Alliance came to a decisive victory in the battle, mostly credited to brilliant strategies and logistics of the Duke of Marlborough. The battle prevented the disintegration of the Grand Alliance. Other great battles in the history of the UK, and their respective dates, are the Battle of Plassey, which was fought on August 13,1704, the Siege of Yorktown in the Fall of 1781, the Battle of Waterloo on June 18, 1815, the Gallipoli Campaign of 1915-1916, the Battle of the Somme of July-November, 1916, and D-Day and the subsequent Invasion of Normandy from June 6-August, 1944. The UK continues to enjoy political stability, although the country’s troops have a presence in some countries. The UK is militarily involved, alongside other super powers, to combat terrorism activities against the Islamic State of Iraq and Levant (ISIL).